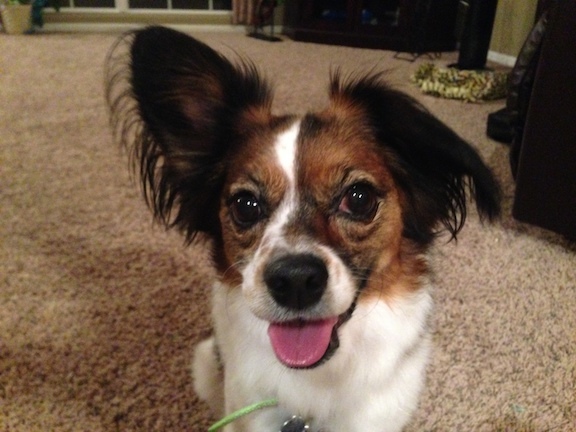 Olivia is a four-year-old Papillon mix who was rescued eight months ago. Her owner called me to put an end to Olivia’s habit of barking, jumping on and nipping at guests who move about in any room Olivia is in. When I arrived for the session Olivia was barking profusely. It was instantly clear that she was barking to let me know that she did not give me permission to be there and that she disagreed with my intrusion into her home. Her owner repeatedly bent down to tell the dog “no” while snapping her fingers at Olivia. Unless her owner was right in front of Olivia, the dog ignored her owner’s corrections. Instead she darted around her owner so that she could charge at me barking her disagreement. I had her owner put the dog on a leash and pulled it close so that Olivia was only a few inches away. This instantly stopped Olivia’s barking. She attempted to pull away, but I held the leash firmly under my foot. Insecure dogs often bark in disagreement from a distance. By putting Olivia on a leash and removing her ability to increase the distance between us, her desire to bark was overcome by her insecurity of being right next to me. After a minute of pulling, Olivia sat down next to my foot. A minute later she calmed down even more and laid down next to my foot. After she was still for a moment, I slowly moved my foot off of the leash so that I was no longer restraining her. She remained there for a few moments before getting up and calmly walking away. It was clear that Olivia considered herself the sheriff or house monitor and was behaving this way in an attempt to control the situation. While some dogs are natural leaders, Olivia was not. I explained to her owner that this behavior was caused in large part due to having no rules, limits or boundaries she was expected to respect. The best way to change a dog’s perception of itself as an authority figure is to start adding rules and boundaries; not allowing the dog on the furniture, not allowing the dog to be near the window if its barking incessantly and making her sit and wait for permission to eat her food. These rules don’t take much time and effort from the owner, but can have a big impact on the dog. I decided to show her owner an exercise to accelerate the dog’s transformation from self appointed leader to follower. It involves claiming a high value treat that is laying in the middle of the living room floor and communicating that the dog cannot have it without permission. I have done this exercise literally thousands of times and each dog is unique, but Olivia was one of the most defiant dogs I encountered. I was turning to keep Olivia in front of me, but as a small quick dog, there were a few times that she was able to get behind me. When she did, she would nip the back of my heel or leg. After a few minutes of this, Olivia sat down a few feet away from the treat. As soon as she did, I turned so that she was on my right side with the treat between us. I kneeled down and tapped the floor near the treat to give her permission to get it. I started to repeat the exercise but got a text from my neighbor who’s dog I had been watching. Normally I dont take calls or texts during a session, but the dog’s owner had set then changed the pickup time a couple times already so I looked down at the text. As soon as I did, Olivia took advantage of my lack of attention and proceeded to jump up and bite my leg so aggressively it ripped a hold in my pants. Thanks Jen! I put her back on the leash and let my neighbor know I was in a session and would call her when I got done. I started the exercise again and was doing well until I got another text from my neighbor demanding to know when Id be home so she could get her dog. When I went to mute my phone to avoid further interruptions, Olivia nipped me again. This is a great example of how important it is to remain focused on a dog with behavioral issues, especially when it starts to become dominant or aggressive. I changed things up and coached Olivia’s owner through the exercise. At first Olivia ignored her owner’s attempts to block her from getting the treat. But after some adjustments to her body language, timing and movement Olivia took notice. After the third time she went through the exercise, Olivia started to understand the rules and how to complete it so she got her reward. I suggested her owner practice this exercise daily for the next few weeks. Not only will this help the dog learn to focus and restrain herself, it will also help her see her owner as more of an authority figure. The more the dog see’s its owner as an authority figure, the less reactive it is to things it doesn’t like or disagrees with. As we were going through the exercise, I was using a hissing sound any time Olivia did something wrong. I wanted her owner to know how and when to use this auditory correction. The first few time I corrected her this way it had the desired effect. But once Olivia realized I was the one correcting her, she started to bark and lunge at me in protest. Because the dog needs to be free to roam around for the exercise, my leash time out method wouldn’t work so I had Olivia’s owner get between us with her back to me. She hissed at the dog and moved towards her to back her away from me. As she did this, Olivia’s barking changed. Instead of a full fledged bark, you could hear some hesitation in her delivery and the frequency of her barks. By stepping in-between us and correcting the dog in a way she understood and responded to, the barking stopped. Once it did, I offered the dog a treat as a reward. Its always important to reward a dog from stopping an unwanted behavior. This type of positive reinforcement takes time, but is effective. By the end of the session Olivia had almost completely stopped her barking, nipping and lunging at me, even when I used the hissing sound to correct her. If her owner continues with the new rules and structure and assumes a leadership position in Olivia’s eyes, the dog’s days of attempting to control and corral the humans who visit their home will soon be over.